Torso pitch: -33° to +96° while standing. -33° to +96° while crouching. The Rifleman is an Inner Sphere Heavy Mech and was added with the 0.6.0 update as a surprise. 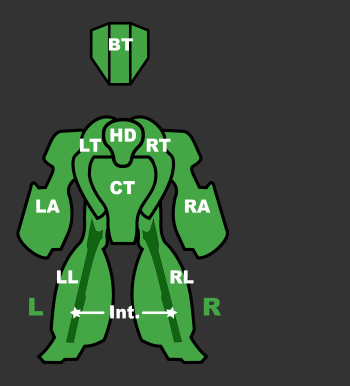 As it is intended primarily as an anti-air mech it sports only moderate speed and armor, but it has the best torso pitch and rotation of any mech. All variants are equipped for anti-aircraft duty and are therefore somewhat efficient against BA, VTOL and light, medium and some heavy ASF. However, their performance against mechs or tanks of similar weight is poor, and Rifleman pilots might find themselves getting easily overwhelmed by medium or even few light assets due to its huge size and poor armor. Thats why Riflemans mostly serve as direct fire support, since they sacrificed speed and armor in favor of weapons. The Rifleman Prime is a well-balanced AA mech. Despite its 2 DHS the Prime runs very hot, as it boasts 2 ERLBLs and 2 ERMBLs. These energy weapons are complemented by 2 UAC5s, making the Prime an good all-round mech. The fact that the Prime is the most armored rifleman with its 11.5t of armor and is mostly an energy-based mech, give it decent staying power. The Prime has EOptics that all Rifleman variants carry, allow it to spot and effectively engage threats at range, aerospace or otherwise. 2 LAMS are attached to fend off missile attacks. The Rifleman A is a long-range version. The A doesn't have the pinpoint damage output of the Prime, but it makes up for that with precise damage from three HVAC2s reaching 1500m outside most other direct-fire weapons' ranges while it fires at aircraft and targets of opportunity. A singular ELRM20, allows the Rifleman A to lock and fire its missiles out to a maximum range of 1500m with six shots per ton. The Rifleman A carries four Free Tons of ammo. Equipped with EOptics which are useful for precision and long-distance aiming, as well as picking out targets from their surroundings that were otherwise undetectable by radar. The Rifleman A is designed to snipe your prey from an unexpected distance of 1500m, but thats the only thing A is somewhat decent for. It might be better to get Rifleman C, and exchange 250m of extra range for more damage and more imposing presence of C's LGauss rifle. A variant designed for mid range engagements, a relative rarity among Riflemen, the Rifleman B packs the meanest alpha of the bunch. Two LBX10 can engage targets from 700m, but the spread of the pellets means the closer the target the more drastic the results, while a battery of four ERMBLs deals a pinpoint blow to the weakened components. Make no mistake though, despite its relatively short reach, the hitscan nature of its lasers and the spread of its Autocannons allow it to punish aircraft that enter its range. Like the Prime this unit also carries 2 LAMS to fend off missile attacks and 2 DHS which are more than enough for the Laser Battery. While other Rifleman variants rely on putting up a wall of projectiles or a laser show to deter enemy aerospace, the Rifleman C trusts in the cool killing power of the Light Gauss Rifle. Two UAC2s provide some additional damage, but their main purpose is to help calculate the lead of the two LtGauss rifles in order to send enemy aerospace hurtling to earth. As the two weapons have nearly the same projectile speed, pulling enough lead to start landing hits with the UAC2s ensures that any following light gauss shots will land right on target. The Rifleman C carries the standard BAP and EOptics as well, though like all Rifleman variants it should be wary of close combat with other ground assets. Four Free tons of ammo keep the 2 LtGauss well supplied. Though the Rifleman D has the same four RAC2 armament as the much cheaper Partisan B, it still has its own niche. The D variant is meant as a group support mech, intended to shield its lance-mates from both radar and aerospace alike while keeping up with them over rough or uneven terrain. An AECM unit gives nearby friendlies radar cover, the 2 LAMS protect from missiles, while a BAP helps the Rifleman D sniff out incoming air or ground assets. Enemy aerospace will have to deal with the hailstorm of RAC2 rounds sent their way, and enemy mech assets will stumble into your lance, expecting only a single heavy mech to deal with. Four Extra Tons of ammo and 2 DHS round out this package. The Rifleman E brings a frightening light show of four ERLBLs to the fight. Though the resulting heat spike from firing all four lasers at once can be worrying, the immense amount of heat dissipation provided by the 9 DHS it carries means that it's possible to start to overheat after intense fighting. With a steady enough hand, the Rifleman E can quickly deal death to any enemy aerospace that is unwise enough to linger inside its 800m range, and can strip enemy mechs of weapons or armor from the relative safety of the second line. A BHP gives even further radar range than most Rifleman variants, preventing most enemies from coming up on it unawares. Double LAMS for protection against missiles, all rounded up by 11t of armor gives E decent battlefield presence. The F variant is somewhat of an oddball. Theoretically, its armament of two AC10s and two PPCs can deal a great amount of damage to anything it manages to hit. However, the fairly slow projectile speed of each, coupled with their restrictive (for anti-aero work) ranges of 550m and 700m, respectively, means that the Rifleman F will have a hard time landing hits on aerospace with either weapon. Rather, the Rifleman F is meant as a direct fire-support mech, intended to sit behind the front lines and pound away at otherwise distracted targets. Unlike other Rifleman variants, the F carries no active probes, and must thus be careful it isn't caught alone. Though its armaments can cause a significant amount of damage, its slow speed and light armor of only 9.5t mean that any assets in its own weight class will easily overpower it. EOptics almost seem wasted on this unit and having only 1 DHS pilots must keep an eye on their temps. B-Pod provides some help with Battle Armor ambushes. The Rifleman G is a is a black sheep of a flock that are Rifleman's, but this sheep have sharp teeths. Instead of running from engagements like other fire support Riflemans, G rushes in with blistering array of 6 MXPLs at 279 shots/min, 28.5damage, per each shot, capable of removing arms and melt armor of opponents that make the mistake of underestimating the G's power. 10 DHS is enough to handle the heat under normal fire, but keeping an eye on you temperature is well advised. Rushing in at 91 km/h with MASC it's good idea to give your unit a few seconds to cool down before opening fire. GECM will keep you under cover right up until your firing range so utilizing the EOptics will help you determine the battle assessment. Bear in mind that rifleman is still rifleman, with its huge size and inadequate armor for heavy mech standarts. But if the G travels with someone who will draw fire away, in few seconds G can dish out plenty of damage, not even high ground can save them. 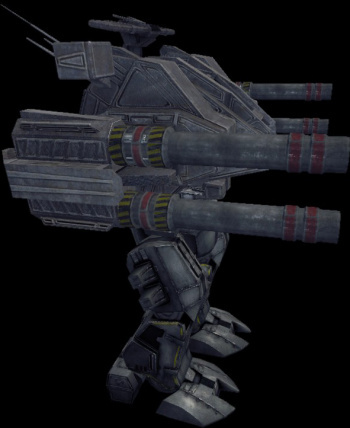 The definitive anti-aircraft 'Mech, the Rifleman was first fielded in 2505, making it amont the first 'Mechs ever built. Its combination of long-ranged weaponry, including rapid-fire autocannons and it's excellent targeting and tracking system ensured it would remain a viable battlefield unit through half a millennium of combat. The Rifleman's focus on anti-aircraft work dictated a heavy load of long-range weapons to the exclusion of everything else. The 'Mech's heat sinks are grossly inadequate for constant fire, but in an anti-aircraft role, the Rifleman is expected to have time to dissipate heat while the target aircraft turns for its next pass. Notable pilots include: Gray Noton "Legend-Killer", Conner Rhys-Monroe "Former Knight of the Sphere", John "Gentleman Johnny" Clavell, and Davis McCall of the Gray Death Legion. This page was last edited on 30 January 2019, at 14:41.